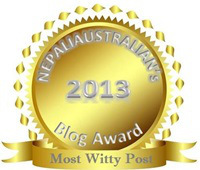 Posted in Flying, Kathmandu, Move, Nepal	by Ms.Z. Getting ready for this move has been a struggle in both emotional and physical ways. It was hard to say goodbye to everyone, especially my family, and it was almost impossible to pack my life in a couple of suitcases. But what needs to be done, needs to done, so I summoned my strength and did it. My trip started with a car drive to an airport in Budapest where, as expected, I had issues with checking in extra luggage. I always have some kind of luggage issues when I travel – it’s like a curse. After accepting the fact that my luggage might not make it with me, and that I will probably end up paying an exorbitant fee for it, I set off on a Finnair flight to Helsinki. I had this vision that Finnair would be an amazing airline with clean, new and technologically advanced planes. Maybe I thought that because that’s what’s expected of northern Europeans to be like. I have to admit I was very disappointed when I realized the plane is old, shabby and poorly cleaned. I still hope the stuff I cleaned off the window was someone’s rice and curry splattered during turbulence, and not something else (let your imagination run wild here). Helsinki airport was also not the modern marvel I expected it to be. It was an awkwardly shaped small airport where everything in the departure terminal closed down at 7pm. I’m in no place to pass judgment considering the state of Zagreb airport, but I simply expected more from Finland. I guess it’s called prejudice and I should shake it off. I do have to commend Finnair and Helsinki airport for a great customer service. Lady at the transfer desk managed to resolve my luggage problem with one phone call and in a matter of seconds (thank you Hungarian lady for creating the problem in the first place, thank you!). Landing in Delhi was, as always, a mixture of smell, color and heat. I don’t like that airport. It seems like the plane always stops at the furthest possible gate and then you are to walk for miles in a very warm (it was 32 degrees celsius when we landed at 5am!) terminal to reach an exit. But, alas, I reached it and was greeted by many employees at the transfer desk. Delhi airport is one of those places where there always seems to be more employees than passengers. Seven of them then started working on issuing my boarding pass for my flight to Kathmandu and I was ushered into a seat in the waiting area where I exchanged several lines and compassionate you’re-waiting-as-well smiles with a Chinese dude. 45 minutes later my boarding pass was ready (were they making the paper themselves?) and I was fighting my way through duty free shop to the gate. I was stopped probably five times and asked whether I am on the flight to London. Talk about prejudice and discrimination. Yes, I know I am very white, and yes, I did have a bag with a UK flag on it, but is that all it takes for someone to assume I am on a flight to London? I proudly said: No, I am going to Kathmandu. I like to believe that startled my interceptors and completely threw them off, though I am pretty sure they couldn’t care less. 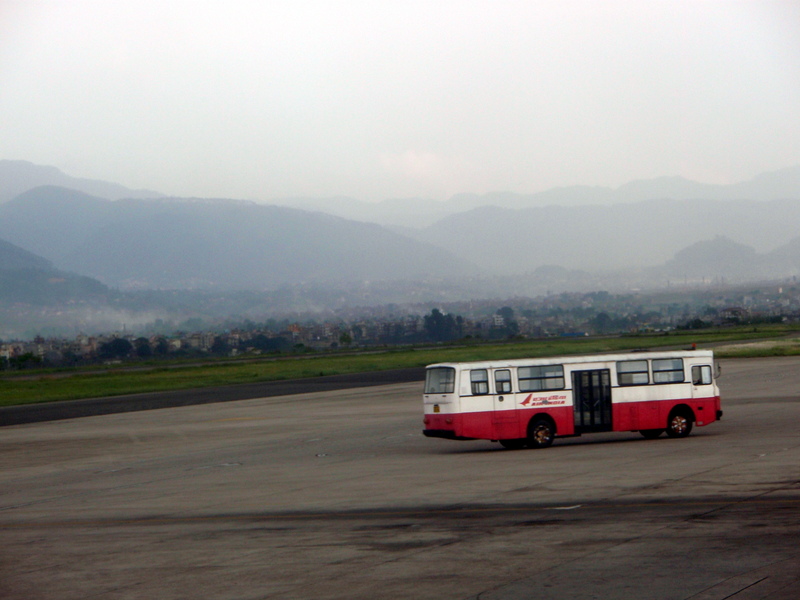 Flight to Kathmandu was unusually uneventful. It might’ve been because I was too tired to even care. I sat there staring at nothing, since my entertainment system didn’t work, yet the flight seemed short. Before I realized it we were landing in Kathmandu and I saw all the tourists on the plane stretching their necks to see the mountains and the city. Clearly I didn’t consider myself to be a tourist, though I couldn’t pass for anything else. Only the last name in my passport gives a small hint of the reason for my staying in Nepal. Everything during arrival went smoothly: I filled out my paperwork and within minutes I got my visa glued in my passport. The immigration officer gave his colleagues a crash course in geography proudly explaining Croatia is in Yugoslavia. I nodded my head in agreement for I had no strength or willpower to recap recent historical events in Europe. I rushed downstairs to get the luggage which was, unbelievably, already doing rounds on a conveyor belt. I grabbed it, rushed past the customs officer not trying to stop at all and out I went eyes wide open, in search of my husband. Taxi drivers where approaching me saying taxi madame, but I felt like I was in one of those movie scenes where things are happening around you but you don’t see or hear anything. There’s music playing and you’re courageously and with determination making your way to your goal. Taxi drivers were just some vague voices fading away in the background. And then there he was. My husband. Waiting for me right outside the door with a huge smile on his face. I’ve made it. The Day finally came. Namaste, Nepal. Sweet ride to the terminal. I was pretty sure we were all going to die right there on the tarmac for the bus was jumping and jostling like a mountain goat.